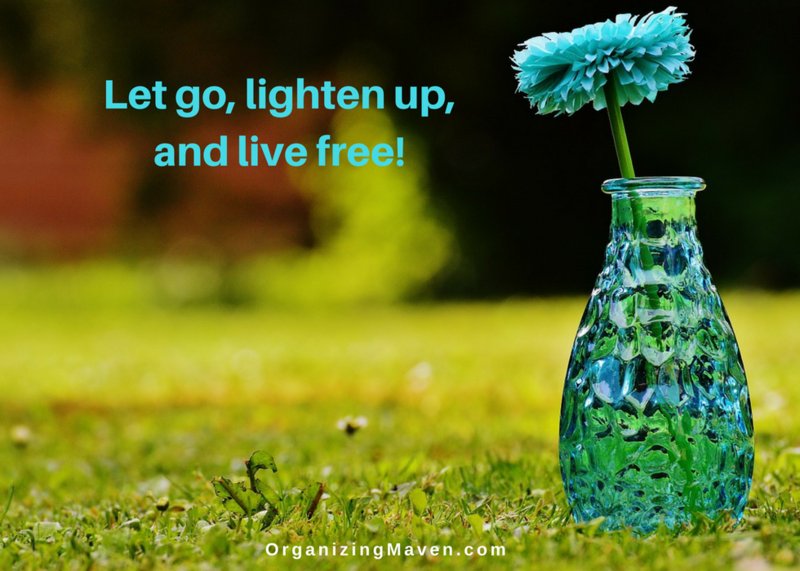 Learn how to let go and get rid of clutter for good! If clutter has become a source of stress, frustration or embarrassment, Clutter Control 101 is for you. It will show you, step by step, how to take charge and clear clutter for good. This is the real deal – as a professional organizer and clutter coach I know what it takes to address the root causes of clutter issues. Clutter isn’t just about your stuff – your mindset and emotions play a huge role. Mental barriers are real and I’ll show you how to break through them! My experience is twofold – I know what you feel like, I have worked through my own issues – lots of them. So you could say my experience comes from experience, but it also comes from years of working in the field and coaching people from all walks of life to success. Learn how to decide what’s truly important, and easily determine what’s not. Create an action plan so clutter never has a chance of making it past your front door. The end result will be that you will know exactly how to put an end to clutter for good! You will be on your way to organized living – which saves time, stress, and money! The stress caused by clutter will be a thing of the past! It’s time to regain control. Clutter is a mixture of many things. It represents delayed decisions, emotional baggage and good intentions. Clutter Control 101 takes you through the entire decluttering process and teaches you how to keep your space clutter free for good, step by step. This is a 6 lesson online workshop, delivered right to your inbox via email. Each weekly lesson is a combination of text and MP3 audio, plus bonus videos to supplement the workshops materials. All the text sections are also recorded as MP3 audio, so you can listen while you drive, walk, or do household chores – it’s a great way to allow the content to really sink in. The videos will be available on demand, so you can watch whenever you feel like it. No matter what your learning style, you’re sure to feel completely comfortable. No matter what your schedule you can fully participate – you decide when you learn because all materials are available 24/7. You’ll also get access to our private group, where you can ask questions, post photos, find support and get inspired. How would it feel let go and lighten up so you can enjoy a truly relaxing Summer? This workshop is scheduled so you can do just that. Harness the power of Spring renewal by joining us now. By the time we welcome Memorial Day you’ll be free of the clutter and all the stress that goes with it . The changing of seasons are a perfect time to create change. Channel nature and make a new beginning for yourself! Remember – you will have 24/7 access to all lessons. This means you can go at that pace that is right for you. Everything is accessible right from your inbox – you do not have to login anywhere or create a special account. The text portions of the lessons will arrive as PDF’s, viewable and printable on all systems. The audio is delivered as an MP3 that you can download and save, so you can listen at your leisure. You will also be provided a link so you can listen online if that is more convenient. The video will be delivered as a link so you can view as often as you wish, whenever it’s convenient for you. You can even download and save everything if you want – it’s all yours to keep for as long as you want. Sign up now – It’s an investment that will pay dividends for years to come! You might be wondering why I am offering such a great deal? Well, it’s not because I’m crazy. It’s that I kept hearing my clients talk about how challenging the financial aspect is, and how they wish they could afford more of my hands on time. So, I asked myself how could I deliver great service at a truly affordable price? Online workshops were the answer! It’s a win-win situation – I can share my knowledge in a way that works with the economic realities that most people face, and my clients can reap the benefits while staying well within their budgets. Did you know clearing clutter actually saves you money? It does, and a whole lot! It’s a proven fact – contact me if you want to know all the ways you’ll save. If you are motivated to create change, this workshop will be as effective as having me physically by your side. Here’s one more thing to know, and that’s what this workshop isn’t…. I’m not offering a cookie cutter approach. We will not be going through your home room-by-room, with me telling you what to discard. That approach would give you temporary improvement at best. Plus, I don’t know what is important to you or relevant to your lifestyle. Only you know that (if you don’t, you will after this workshop!). This is about creating the mindset and building the habits that will allow you to let go with ease, and then stay clutter free for life. What you work on will be unique to your situation. But we will cover all areas of life, so we’ll be talking about physical, mental and emotional clutter. To make the decision making process easy, I offer a risk free guarantee and a generous refund policy. If you sign up (it’s a great value at just $79) and find that the class is not what you were expecting, just let me know before the second lesson is released (in this case, by January 21) and I will refund your tuition, no questions, no quibbles. In any event, the information from Lessons One is yours to keep and use. Refunds beyond Lesson One require taking the course to completion: If you take the class to completion and find it’s not providing the benefits you were looking for, then simply let me know how it failed you. At that point all I ask is that you tell me how you implemented the processes and used the planning guide. What I’ll be seeking is some detailed feedback on how to make the workshop better (we’ll book a call to have a quick conversation so I can learn from you and then I’ll happily issue your refund). So, what at are you waiting for? Clutter is piling up. Time is going by. Take advantage of the no risk sign up and get on the right path, the path that leads to clutter free living! Imagine how good that will feel! Click the ‘Sign Me Up‘ button to register. It’s fast, easy and secure! The next online workshop starts Tuesday, April 16th. Sign up today – you’ll be clutter free and able enjoy living without the stress of too much and too many obligations!